Team Issue is engineering the future of football technology. We've worked under the simple mission of enhancing athletic performance through innovation and superior design. Meticulously crafted, rigorously tested and fully customizable, Team Issue footballs are the best ever created. 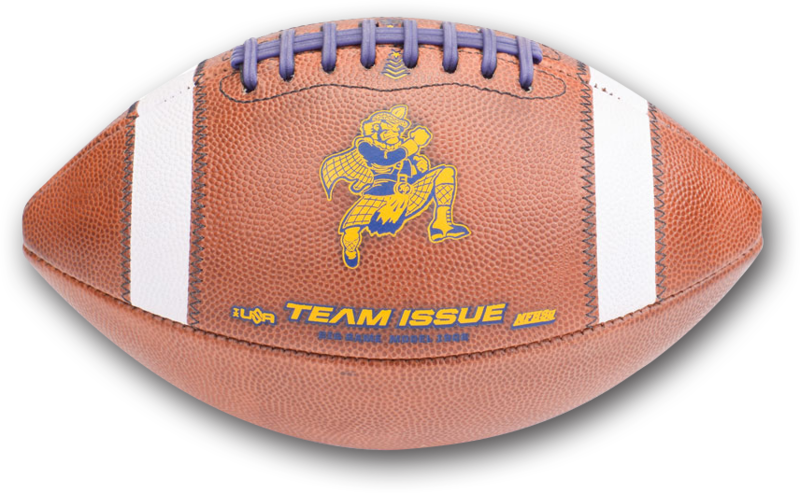 Rest assured, when you purchase from Team Issue, you deal directly with the people who built your football. Unlike big, impersonal distributors, our products are made without compromise. We take great pride in working closely with our athletes to insure that we deliver the absolute best product and experience possible. The game is evolving, so why shouldn't your football? At Team Issue, we develop the technologies that propel your game forward. Built with cutting-edge innovation, unsurpassed quality and an unprecedented commitment to excellence, we’ve designed the best football ever made. 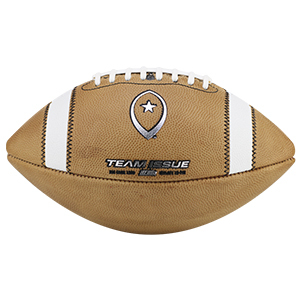 Introducing the football of the twenty-first century: The Team Issue Collegiate Leather Football. Engineered using exclusive proprietary techniques, our footballs boast superior durability and performance, and are carefully designed to enhance distance, control and spin. Team Issue Footballs are also fully customizable, offering teams the opportunity to build a gameball ideal to their own quarterback’s unique playing style; optional features include our revolutionary Shape Retention Stitch™ as well as many lace and leather options. All Team Issue gameballs are handmade in the U.S. from premium extra-tacky top-grain leather and pro quality 3-ply liner, and comply with official collegiate size and weight restrictions. Team Issue Tryout Pack - Change the Game! Coaches know how important it is to get the right football in their players’ hands, and so do we. That’s why Team Issue offers multiple leathers, shapes, stripe options, lace choices, and hundreds of configurations - all interchangeable. Now you can find the right combination of grip, balance, shape, and spin to meet the needs of your team! This Tryout Pack offers you the chance to sample the three footballs that represent our most popular options. 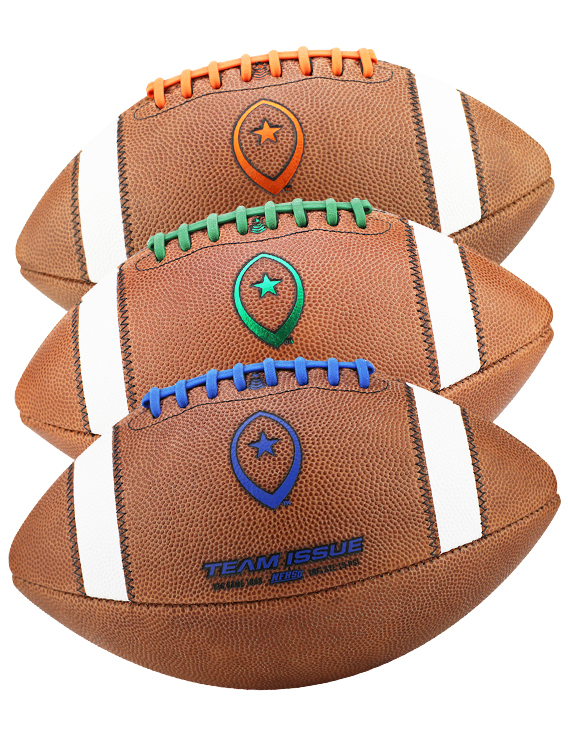 Your team will receive three footballs with different leathers, shape options, and lace styles (shown below). Choose the best combination with this tryout pack and let Team Issue build your team’s perfect pigskin. Designed with the pure passer in mind. Made using pro football’s red 864 leather with a pro shape for bigger handed quarterbacks and a clutch half stripe for a minimalistic feel. Our most popular configuration features high-tack brown leather that’s shaped for average-sized hands. The Shape Retention Stitch (SRS) enhances durability and helps the football retain its shape. Built for the scrambler who can shred defenses with his arm or his legs. Natural leather, a super slim shape for smaller hands and zigzag Shape Retention Stitch (SRS) for added durability. Build the perfect pigskin with the Team Issue Tryout Pack!